Global warming leads to increased endosymbiotic archaeal growth and generation of neuronal cellular organelle called the archaeaon. The archaeal magnetite is capable of quantal perception of low level electromagnetic fields contributing to cerebral cortical atrophy and cerebellar dominance. 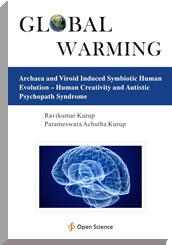 This leads to an epidemic autistic psychopath syndrome with increased creativity, impulsivity, extrasensory perception and surrealistic behaviour. This leads to changes in the nature of society and civilizations.